Dean Loree (left) and Jim King-Seguin (Will Grummett’s Grandson) and Will Grummett’s officer’s locker. 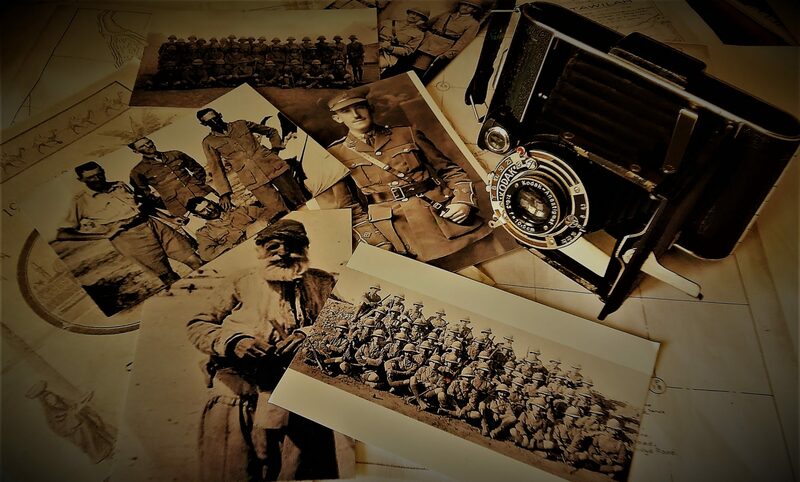 As I began the research in support of my effort to tell Will Grummett’s World War One story, I quickly became aware of the importance of little things, details, that made connections that gave the story depth and continuity. Such things as, a military order sheet with a name, a notebook with a place name, a date with a place, a photo with a date, a one line entry in an honour roll, all provided clues and corroboration that resulted in the fixed or known places and times from which the story is told. Without a collection of objects, images and records, any biographical tale would have no ground to stand upon and would dissolve into fictional imaginings. Additions to the collection of this most basic information are like gold. Since gold is rare, and metaphorical gold even rarer, and the willingness to share it even rarer than that, you can imagine how surprised I was when Dean Loree of Kitchener, Ontario contacted me to say he had Will Grummett’s officer’s travel locker. Dean is a collector of things military and he purchased the locker some years ago at an estate sale. Dean added the locker to his collection because it was a fine example of its kind, and it had a personal connection since the officer’s name, W.J. Grummett, was painted on the lid. Dean likes a good story, and is particularly interested in the stories of those brave souls who are willing to fight for their country. I think he discovered that W.J. Grummett was the former Ontario provincial politician Bill Grummett, but could only speculate on the details of his wartime story until he found our website. Dean read through the chapters of Will’s story, and got some answers to his questions, and filled in a lot of empty spaces about, “Who was this W.J. Grummett who purchased such a fine officer’s locker?” And, as happens with generous people who are more interested in the story than the things, Dean felt the proper place for the locker was with the family and the people who took the time and effort to provide the answers to his questions about 2nd Lieutenant Grummett. The locker is now reunited with many of its original contents, Will’s uniforms, papers and his wonderful photographs. Thank you Dean Loree. You are now part of the story. Shortly after receiving his commission in the British Army in June of 1916, Will Grummett outfitted himself, as required, with uniforms from Studd and Millington, 67-69 Chancery Lane, London, WC. They were made to measure and because of that, they were expensive. With uniforms to care for and carry about, he would have required a locker or large case. As a private soldier in the Canadian Army, as he was prior to receiving his commission as a 2nd Lieutenant in the British Army, I expect he carried his things in an ordinary duffel bag. He couldn’t very well do that with his tailored uniforms, or the sword (also required), so he purchased a travel locker. Will Grummett’s officer’s sword. The sword was worn as part of the full dress uniform. Will bought the locker late in 1916, and had it labelled soon after receiving the order transferring him to the 2nd Battalion of the Norfolk Regiment (from the 10th Battalion) attached to the British Indian Army in India. His name and connection to the 2nd Battalion are prominently displayed atop the locker in a fine professionally painted hand. Lid of the travel locker. He purchased the locker from Thresher and Glenny of London; their maker’s label is intact on the locker. Thresher and Glenny is Britian’s oldest military outfitter and tailor; they are still in business making bespoke suits for royalty and the very wealthy. The locker is of high quality. It seems intended for use by commissioned officers since it is equipped with tie downs that appear to be there to securely hold an officer’s sword. It is rare for lockers of this type to be lined with a thick copper foil as this one is (see pictures below). The copper foil probably represents an additional cost, but was not intended to impress. It was meant to protect its contents, uniforms and such from pests, right down to the bacterial level (oxides on the surface of copper produce a known anti-bacterial effect). Was that an extra precaution because of the nature of the Indian and Mesopotamian climates he was headed to? Probably, and it was probably at the suggestion of Thresher and Glenny, as added insurance so that his expensive uniforms would survive the adventure. Thankfully, Will, his uniforms and the locker did survive and came home. When Will left home again in the fall of 1919 to resume his studies at Osgoode Hall, we think the locker remained at the family home, probably in the attic of the farmhouse and may have been there for as long as fifty years until the death of Will’s brother Herbert (the youngest of the boys, see the family photo in Post#1) in the 1970’s. Shortly after Herbert’s passing the house and its contents were sold.